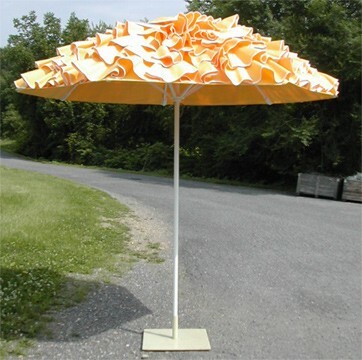 RT202 Ruffled Umbrella | American Holtzkraft, Inc. The genius of this fun and flirtatious design is all in the craftsmanship of American Holtzkraft’s talented seamstress division. Sunbrella solution dyed, outdoor, acrylics are painstakingly fashioned into soft, full ruffles reminiscent of a coquettish Southern Belle’s swaying skirts or a light, frothy sugar confection plucked from your childish dreams. This design is adaptable to a host of thematic installations only limited by the imagination of the romantic adventurer.